How They WorkGrinders use horizontally rotating discs to perform a multitude of tasks, from light texturing to open the pores of the surface to removal of paints and thin coatings. The key to their versatility are the grinding attachments, which are available in a variety of types and grits to suit different applications. Because grinders use rotary action rather than impact to remove material, the depth of material removal is limited to about 1/8 inch, depending on the type of attachment used. They generally leave behind a smoother profile than scarifying or shotblasting, and when working on hard, dense concrete they may polish rather than abrade the surface. For floor and slab surfaces, you can find walk-behind grinders ranging in size from single-disc units for working in small or restricted areas to dual-, triple- or even four-disc machines for high-production grinding of large slabs. A single-disc grinder has a working width of 10 to 12 inches while a dual-disc unit covers 20 or more inches in one pass. Disc rotation speeds range from about 250 to over 3,000 rpm. On multiple-disc units, the discs usually are counter-rotating to provide balanced torque so the grinder won't pull from side to side. For more even grinding, some machines are also equipped with floating heads that will follow the contour of the floor and adjustable rear wheels to keep the grinding discs level. Many manufacturers offer a choice of power options, including electric, gasoline and propane. Most machines are equipped with vacuum ports for dust-free dry grinding. Some models also include water mist systems so they can be used with wet- or dry-cutting attachments. 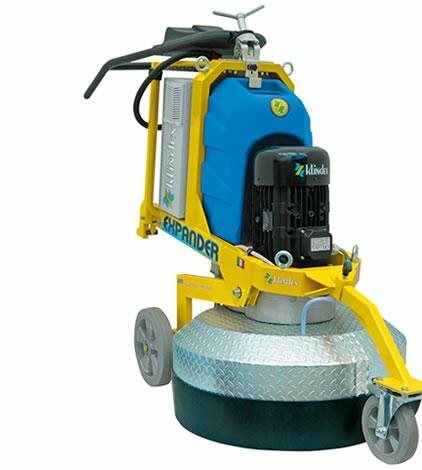 Although walk-behind machines are well suited for profiling large slab surfaces, you can also buy handheld grinders for working in tight areas where larger units can't maneuver, such as in corners and close to walls. 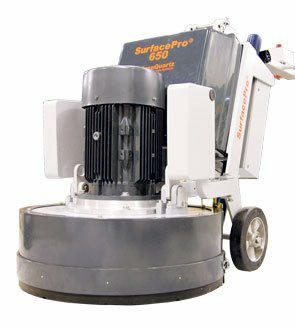 These smaller workhorsesare available with grinding diameters ranging from 5 to 12 inches and can also be used to remove bumps, form marks, and graffiti from vertical surfaces or to grind concrete countertops (see A Definitive Polisher for Concrete). Like their larger cousins, handheld units come with a selection of grinding accessories and can be hooked up to an industrial vac for dust control. Typical ApplicationsMany of today's grinders can serve multiple functions and are generally more adaptable than other types of surface prep equipment, especially when it comes to decorative work. They are a good solution for profiling floors before application of thin coatings or paints because they won't create ridges in the surface, as can scarifiers. Other applications include breaking up deposits of grease, dirt and industrial contaminants and leveling uneven joints or high spots. Many contractors also use grinders with finer-grit abrasives to polish concrete surfaces. Attachment OptionsInvesting in an assortment of attachments for your grinder will maximize its versatility and allow you to perform a broader range of tasks with one machine. The three most common types of grinding attachments are silicon-carbide-impregnated grinding stones, tungsten-carbide inserts, and diamond-segmented grinding tools. Some grinders are also available with scarifying attachments for removing thicker coatings and mastics. Available in various grits for coarse or fine polishing, silicon-carbide stones are an economical choice for such applications as smoothing trowel marks or rough finishes and leveling high spots less than 1/16 inch. However, these stones can clog easily, which can make them inefficient at removing most coatings. Tungsten-carbide inserts and diamond grinding accessories remove surface coatings with greater speed and efficiency. Tungsten-carbide inserts are carbide-tipped blocks with beveled edges that can strip heavier buildups or coatings without digging into the concrete. Their removal action, which is similar to using a scraper, works best in materials thicker than 1/16 inch. Applications include removing adhesives, thick paints, resins, tar, industrial buildups and rubber deposits. For profiling work and removal of thin-film coatings or coatings with high hardness values, such as urethanes and epoxies, diamond-segmented abrasives are generally the best solution. Other applications include polishing and removing minor surface imperfections. The diamond segments, which are bonded to a backing plate or to removable block inserts or plugs, sit on the surface and are embedded in a metal or resin matrix. During grinding, the matrix wears away gradually to expose new diamonds. You can choose diamond tooling in various grit levels, ranging from fine to coarse, and with different bond hardnesses, shapes and diamond concentrations, allowing you to match the tool to your project requirements. Regardless of the attachment you use, look for inserts or grinding discs that are easily replaceable. This will allow you to move more easily from coarser to finer grit levels. Despite their versatility, grinders generally aren't designed for aggressive profiling jobs, and there are certain coatings a traditional grinder just can't remove. They are most effective at removing thin coatings and paints or for cleaning and lightly abrading floor surfaces. When deciding between tungsten carbide and diamond attachments for coating removal, the main factors to consider are the material type and thickness and the strength of the mechanical bond to the surface. One manufacturer offers this tip: If the material to be removed can be cut with a knife, use tungsten carbide. Diamond segments are more suitable for thinner coatings no greater than 1/16 inch. When using diamond tooling, it's important to choose the right bond hardness of the matrix (the material that holds the diamond segments) to achieve greater efficiency and to maximize tool life. In general, use a hard bond when grinding soft materials and a soft bond for hard materials. Softer materials wear away the diamonds more quickly. SC12E Scarifier SASE The industry's most durable and productive scarifier. Alpha Tools Ecogrinder High performance grinder. Comes with built-in vacuum system. Multi Purpose Portable Grinder Easily transported in the trunk of a small car, 150 lbs. GranQuartz Grinding Catalog Catalog of grinding machines suited for your surface prep needs.